Identity Resolution is a major new upgrade to the Segment platform. The Segment Identity Graph merges the complete history of each customer into a single profile, no matter where they interact with your business. 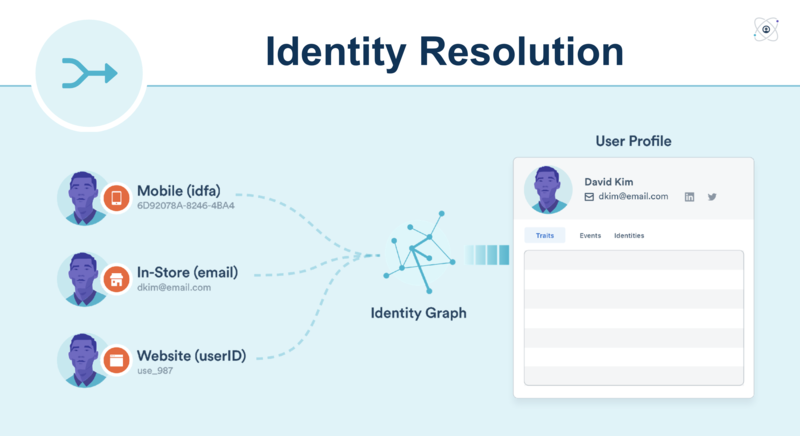 Identity Resolution allows you to understand a user’s interaction across web, mobile, server, and third party partner touch-points in realtime, using an online and offline ID graph with support for cookie IDs, device IDs, emails, and custom external IDs. If you are sending the group call, you can also understand user behavior at the account-level. Maintains persistent ID — multiple external IDs get matched to one persistent ID. At this point, the Identity Graph will create a new user with external id (anonymous_id: anon_123) and a persistent and globally unique segment_id, in this case: use_4paotyretuj4Ta2bEYQ0vKOq1e7. Any new events received with the same external id (anonymous_id: anon_123) will be appended to same user use_4paotyretuj4Ta2bEYQ0vKOq1e7. At this point, the Identity Graph associates external ID (user_id: use_123) with the same user use_4paotyretuj4Ta2bEYQ0vKOq1e7. 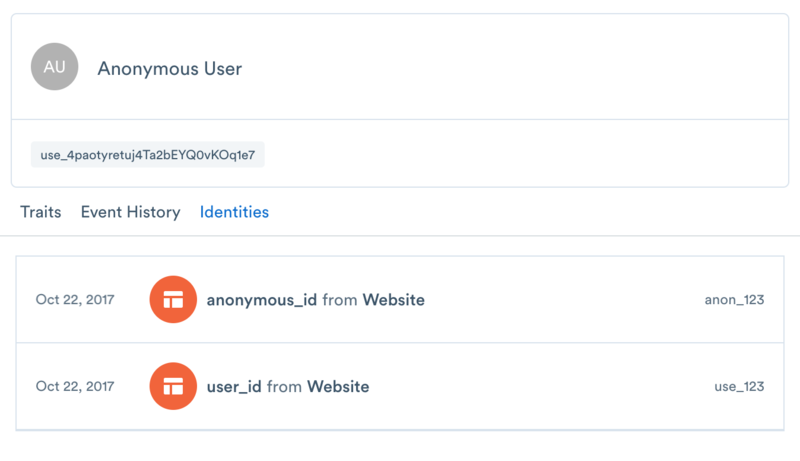 And if you’re going beyond customer data (the users collection), Personas will automatically resolve identity for any other external ID’s that you bind to users - such as a phone number or any custom identifier that you support. As seen in the below example, you can send custom externalIds in the context object of any call to our API. Personas will automatically create a user (user_id: use_123) with the custom externalId (phone: 123-456-7890). Then, you query the users phone record by using the external id (phone: 123-456-7890), or update this profile using that externalId going forward.